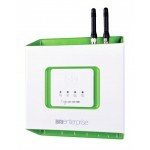 The 2N® BRI Enterprise Gateway features all the functions of the BRI Lite. Counting free minutes with an efficient automated cost-saving solution create an ideal tool for reducing call charge costs. The CallBack service eliminates roaming fees on business trips abroad and sending and receiving SMS from PC is also a cinch.